She is well-known before as the nanny Maya in the hit daytime TV series "Be Careful with My Heart." But this year, she returns in the TV series world in primetime with vengeance and power playing the iconic character of Amor Powers in today's remake of the classic teleserye "Pangako Sa'yo." Yes, Jodi Sta. Maria shifts from a humorous Maya to a vengeful Amor! Her style of giving a new life to Amor Powers is really commendable and deserves a well-round of applause! Even Ms. Eula Valdes, the actress who originally played Amor Powers in the year 2000 version of "Pangako Sa'yo" praised the acting of Jodi as the new Amor Powers! We were also amazed by Jodi's acting giving justice to the iconic legendary character. Therefore, we are giving this recognition to Ms. Jodi Sta. 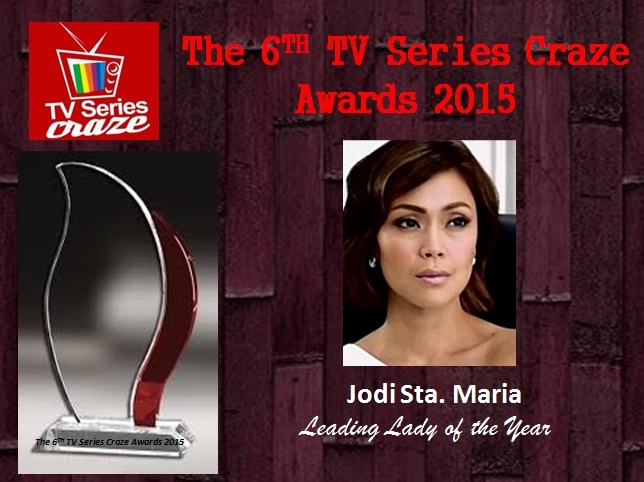 Maria as the Leading Lady of the Year here in our very own The 6TH TV Series Craze Awards 2015. Aside from heavy drama, Jodi also shares her lighter and rom-com side in the story every time she has scenes with Ian Veneracion who is playing Gov. Eduardo Buenavista. Their loveteam now known as AmorAdo is well-loved and accepted by viewers and netizens. Definitely, they are 100% nakakakilig and truly perfect together! Congratulations and You deserve this recognizion and the award..